From Michigan State University's School of Music and from the Brighton Bands in Tennessee, here is a nice explanation of these musical terms! With the possible exception of the slur, articulations are always subject to the whim of the performer. However, it is important for the composer/arranger to give as much information as possible to the performer/conductor/section leader so that they are not in the dark regarding such an important parameter. Articulations have two parts, the initial attack and the release. In most cases the initial attack is usually consistently played by most performers according to the following definitions; it is in the release that the most variation occurs. In fact, various textbooks and instruction manuals give different definitions for articulation releases. Because of this, most of the redundant elements of an articulation directly relate to the release. 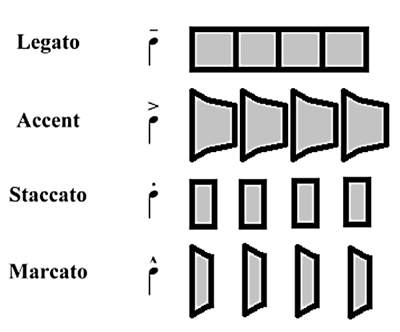 Staccato: unaccented or slightly accented initial tongue, note held half the value of the note to which it is attached. However, many performers interpret this as simply a short note, regardless of the rhythm. Accent: accented initial tongue, note held full value for shorter notes, but often separated for longer notes. Tenuto: unaccented initial tongue, note held full value. However, some performers make a small separation before the next pitch, and some use a slightly accented attack. Marcato: heavily accented initial tongue, clear separation before next note. Of the above definitions, the slur and the tenuto are the most consistent defined in both textbooks and performance. However, even these are often played in a different manner by many musicians. The most consistently played articulation is the slur. There are two basic variations which are indicated through the addition of other articulations. The confusion with most staccato notes is their length. In spite of the definition that a staccato is 1/2 the length of the note, many performers, if not most, play staccato notes short, disregarding the length of the written note. If a composer would like the note to be held a bit longer they usually attach a tenuto mark to the articulation. Another method that some composers have used is to place staccato notes under a slur, indicating somewhat obscurely that these should be "smoother" notes, with just a small space between the notes. This method is usually used with faster passages, and may be more confusing than helpful. Accents invariably are attacked initially. The strength of the attack is usually related to the dynamic. However, the length of the accented note is the part in question. Most performers tend to leave a space between the accented note and the next pitch, although this is by no means universal as some performers hold accented notes full value. Composers generally use one of three means to more clearly indicate the length of the accented not. "A" indicates a short, accented note. This is essentially the same as the marcato. However, the marcato is usually reserved for very loud notes. For notes in the mp to f range this may be a better choice. "B" indicates an accented note held full length. "C" also indicates an accented note held full length. However, many performers interpret this as using breath accents, where the notes are started with a heavy breath accent and not the tongue. If you want to eliminate the possibility of breath accents use "B". If you want the breath accents, write "Breath accents" above the notes, or indicate it in the performance notes. As we have seen, the tenuto mark is often used in conjunction with the staccato and the accent to more clearly indicated the length of those notes. However, when used by itself performers have also found ways to devise variations on this seemingly invariable note. The most common variation is found with a string of tenuto notes. Performers often have a tendency to make slight separations, even though this is clearly "against the rules". Because of this, a string of tenuto notes is often found under a slur to indicate it is clearly meant to be played with a legato tongue with each note connected to the next. As with the accent under a slur, many performers interpret this as using small breath accents, especially in jazz scores. The marcato is almost always played with a heavy attack and a clear separation before the next note. However, since this articulation is often used with very loud notes, these sometimes take on a longer length than desired by the composer. To play a very short marcato note combine the marcato with a staccato. Notice that the marcato is placed above the staff. Although other articulations are usually placed at the notehead, marcatos are usually placed above the staff regardless of the direction of the note and its stem.